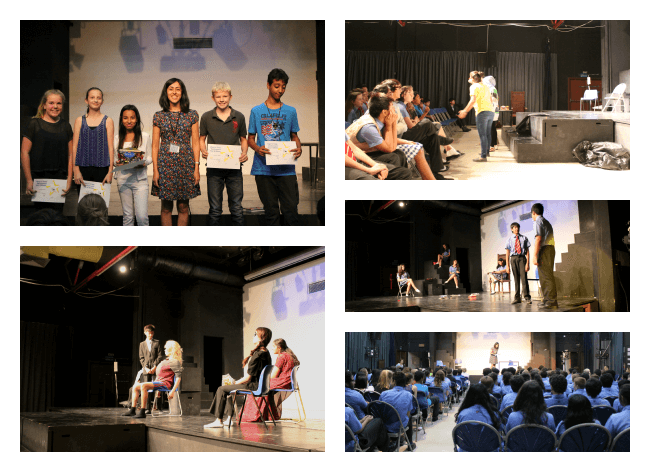 Monday 23 June saw the final performances of the Year 8 ‘Page to Stage’ English and Drama competition. Each class had explored play texts in English and had devised, written and rehearsed them in Drama lessons. The pieces were performed in front of a judging Drama teacher and the best team from each group went into the final competition. Raqaya Aamer from LAMDA was invited to be our visiting judge. She commented on the focus and commitment of the students and thoroughly enjoyed the final performances. The title for the competition was ‘The Incident’. The winning performance team created a piece of tension surrounding a family where the daughter had disappeared. The group from 8F worked well together as an ensemble and were praised for creating atmosphere. A group from 8E won the script writing prize and were commended for their use of plot and characters. Thanks to all the students and staff for their hard work.